We begin in Scotland, where textile researchers are currently working to perfect material that can generate and store static electricity through the natural rubbing of material. 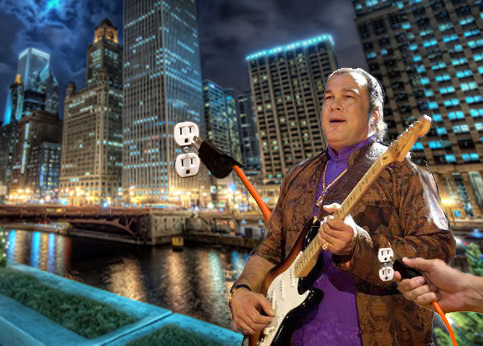 This would allow wearers of clothing made with “Smart Yarn” to generate their own power for things like cell phones, iPods, laptops or, in the case of a full-length kimono worn by Steven Seagal, a small Chicago suburb. The technology is relatively simple, and dates back to the early 1970s, when a combination of corduroy pants, wool socks and shag carpeting was blamed on the electrocution deaths of several people in the U.S. and Canada. According to Scotland researchers, they are close to finding a way of harnessing that power while, at the same time, reviving as few fashions from the 1970s as possible. Next, we have Spanish designer Marti Guixe, creator of the “Flamp,” a phosphorescent lamp that absorbs light from other sources and can illuminate a room for up to 20 minutes without electricity once the lights go out. Accept for the fact that, once I turn the lights out, it’s usually because I WANT TO GO TO SLEEP. And I should mention that the “Flamp” doesn’t come with an “Off” switch, which means, unless you regularly read before bed, you will need to find a way of killing the 20 minutes it takes your “Flamp” to fade out each night. My suggestion is to hold it directly under your chin, make a scary face, and then peek into your neighbors’ windows before bed time. Eventually, they will get used to it and begin to welcome your nightly visits. Or, quite possibly, you’ll get your “Flamp” shot off the very first night. Either way, your problem will be solved. Also on the high-tech home front is something that is sure to re-kindle fond memories of that first apartment. No, I’m not talking about cardboard coffee tables, but the next best thing — inflatable furniture. That’s right, for a mere $800, you can again have the same bedroom ensemble you once paid $6 for. In addition, Ikea USA, makers of the new inflatable furniture, also offers sofas and chairs made from a “special plastic” that’s guaranteed to last for 10 years — which is about how long it will take for you to blow up your new six-piece living room set once it arrives. And finally, we go to Tokyo, where a recent trade show featuring “Homes of Tomorrow” unveiled the perfect example of what happens when technology meets toiletry. I’m talking, of course, about a new computerized toilet introduced by Matsushita Electric. According to Matsushita, the new Laboratory Toilet has a number of improvements over older toilet designs, including a remote control flushing system. Nope. I honestly can’t think of a single reason I’d need to flush my toilet from anywhere other than the bathroom. And if I ever DO need to gain a safe distance from my commode before flushing, finding the remote will be the least of my worries. The last thing I need in my house is another remote! I’d click the thing 10 times wondering why I wasn’t finding HGTV on the television while, ironically, my toilet was over-flowing.